Music means something completely different for Jason Alvarez these days. Now a pastor, along with his wife, Gale, at The Love of Jesus Family Church in Orange, New Jersey, Alvarez is making music because of the change that Jesus Christ has brought to his life — a different source of inspiration than that which had thrust him into fame and mainstream success forty years ago. As a gifted young musician, Alvarez was living the kind of fantasy life he’d always envisioned for himself — touring all over Europe, playing television shows next to Mick Jagger and Elton John, and getting hooked on the reckless pleasures that the rock n’ roll lifestyle affords. But as the initial high of his success began to fade, as the lights went down and the eager applause of audiences faded to a hollow echo of fleeting importance in a world that refused to remain conquered, Alvarez felt increasingly alone in his search for the kind of lasting joy he craved, for something more meaningful and more profound than the fickle gratification of success. Alvarez, who pondered suicide on multiple occasions, found redemption through his wife’s decision to become a Christian. After giving her a ride to church one day, Alvarez followed her in and heard the gospel for the first time. There was a change in him, a revelation of finding and being found, and a realization that his search for more had not been a random detour, but a necessary turn in his journey toward finding his true purpose. It wasn’t long until Alvarez was making Christian music with Andraé Crouch collaborator Bill Cole on the album Just Give Me Jesus in 1982. 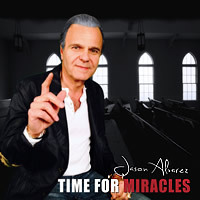 Over thirty years later, Alvarez is as inspired as ever with a brand new album of worshipful songs entitled Time for Miracles. Time for Miracles is an exceptional set of eight songs, conceived in unbridled, heartfelt moments of celebration shared with his own worship community. The Love of Jesus Family Church is uniquely equipped to capture the inspired moments found on Alvarez’s new album, which allows the listeners to truly feel as if they are present with the congregation. “We are so fortunate,” says Alvarez. “God has blessed us, and we have a beautiful studio that has been built for us. So we are all plugged into the studio in the sanctuary, so that when we do something live, we can capture it. “You Are So Beautiful” is one such track. “I had just discovered that [well-known worship leader] Darlene Zschech had been battling cancer,” recalls Alvarez. “I was oblivious to it, but when I found out, I felt led to stop and pray for her at the church. As we began to pray, that song fell on us. ‘You are so beautiful, you are magnificent’ and we broke out into celebration. Miracles came unexpectedly while Alvarez was in a counseling session. After hearing the first part of the song in his head earlier in the day, “All of a sudden, I felt inspired to pick up my guitar and had to excuse myself,” he remembered with a laugh. After a short break, Alvarez completed the song and returned to his meeting. Although his dual roles as pastor and recording artist require the kind of highenergy personal commitment that might overwhelm the average person, Alvarez remains impassioned and energized, viewing his roles as an extension of the Spirit’s work in his life and crediting his ceaseless ambition to the spiritual invigoration of his calling—a mindset that keeps his talent fresh and his conviction focused, even after decades of work. “I tell all of my young ministers to simply love God, and love people,” says Alvarez. “I believe that’s the essence of ministry: love God, and love others. God has given me such a love for people that pastoring is very easy for me. My flock is full of awesome people, and I have an amazing church, so pastoring is a joy—never a burden.